I had some folks from Southern Oregon contact me. 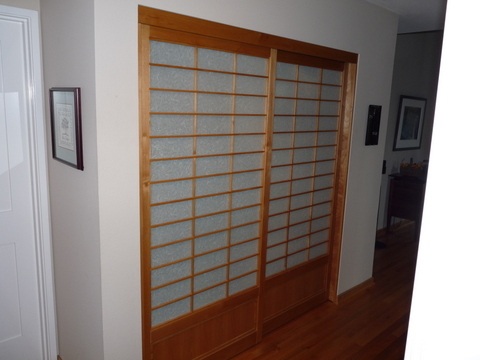 They had a 4 panel, folding Shoji they brought back from Japan. This was interesting in it’s self as they don’t make a lot of folding screen in Japan. We had to coordinate the shoji delivery as they were passing through Portland from Ashland (Southern Oregon) and had a small window to stop by the shop with the shoji. I assume this was a “made for export” item. 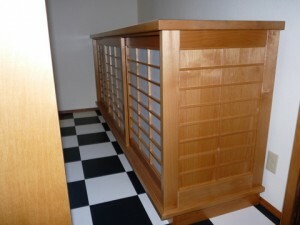 it was well made and appeared to be of Hinoki or Sugi Japanese wood. I removed the old paper and replaced with a Kozo (Japanese Mulberry) type paper. Tough and a little thicker than the thin paper usually used. Real Shoji-paper is usually about like a rolling-paper thickness. It is NOT made of rice as most people think. You need to use the correct glue on Shoji as it needs to be easily removed. You don’t want to sand the kumiko, just use warm water, a plant sprayer and don’t soak the wood,as it may stain the wood. Cedar will release tannins into water (or even the glue) and it makes a light brown stain. If the paper doesn’t want to come off easily, soak some rags. I would tear off strips approx. 1-1/2″ to 2″ wide, wet them, and leave them as long (length-wise) as you can. Damp but not real wet, and folded, you can lay them onto the glue side of the Kumiko and allow to absorb some of the moisture. This should make it come right off. Use a small scraper and carefully remove all the glue you can. Wipe down the wood before it absorbs on the sides and face of the Kumiko. You can make your own riceglue by boiling up some sticky rice. keep adding water as it cooks out, then run through a blender or even a Nutri-Bullit. I buy a glue strainer from an Art store but you can find them at paint stores too, they’re much bigger though. Anyway, strain it through the netting and put it into a glue type bottle. I buy bottles from the dollar store. They are made for hair products, ketchup, paint etc. Needs about a 1/16″ hole, maybe slightly bigger. 1/8″ hole is as big as I would go. Glue needs to be runny enough to flow and gooey enough to stay in a line when you squeeze it out. Before you do your shoji, better practice on some wood and practice laying the paper on. The glue will spread once the paper hit’s it. We use rice-glue as it shouldn’t leave a stain once it’s dry. So, lay the shoji on a bench or some sawhorses at waist height for ease. cut your paper to fit the door. If you’re having to use regular shoji paper in the 11″ rolls then figure out where the roll will cross a kumiko strip and trim it so the paper stops in the middle of the kumiko. I use a sharp saw blade in my table saw and cut the whole roll. In the case of these shoji in the pix, I cut off a 37″ roll to 18-1/4″. Lay the paper in the shoji to make sure it fits. allow cutting off an extra 1/8″. In my case, the shoji kumiko was 18-3/8″ wide. Having extra space makes it lay down nicely. If it is tight or pinches, it will hang up and cause the paper to bunch up. Lay a bead of glue on ALL kumiko and carefully lay the paper into the shoji and roll it out. If it messes up bad, just cut it off and wipe down all the kumiko and start over. If you have 3 shoji to do, I’ll bet the first one is funky and by the 3rd one you will be an expert. I cut off the paper with a razor knife and then trim it off so it lays in there nicely. Allow to dry completely. Trim any excess paper and lay on the bench again face down. When completely dry, lightly spray the paper with a plant type sprayer. I use one from Home depot and it has an adjustable nozzle. You want a fine spray over most of the paper but don’t soak it. if it starts getting real wet…STOP! Allow to dry and start over. Too much water will cause the glue to loosen (like when you removed the paper). You can set the shoji in the sun to dry (watch out the wind doesn’t blow them over) or use a hairdryer or heat gun. You could put the shoji in a unused room and turn the heat up all the way, also. That’s about it. If there are wrinkles. them spray that area again and use a hairdryer. You may have to do this several times to get ALL the wrinkles out. A few small wrinkles won’t be a be deal. Some of my clients become patrons. 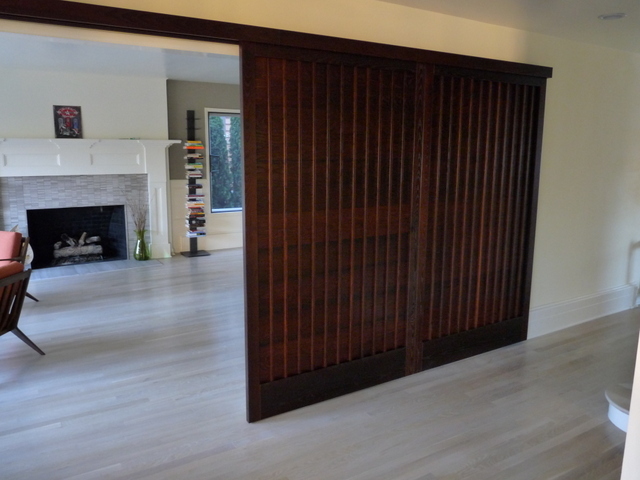 In this case, Lauretta and her sister Diana hired me a couple years ago to build shoji for their newly remodeled basement and create a bedroom. I blocked off the end of one room with 2 large shoji made of my favorite wood: Superior Grade Alder. About a year ago, there was some talk between us about adding a cabinet. They had already discussed this with a cabinet maker in The Dalles OR, where they live. he was to make something that would require 2 or maybe 3 Shoji to cover part of it. 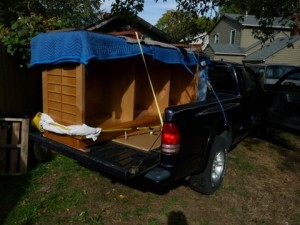 It was to have some drawers. 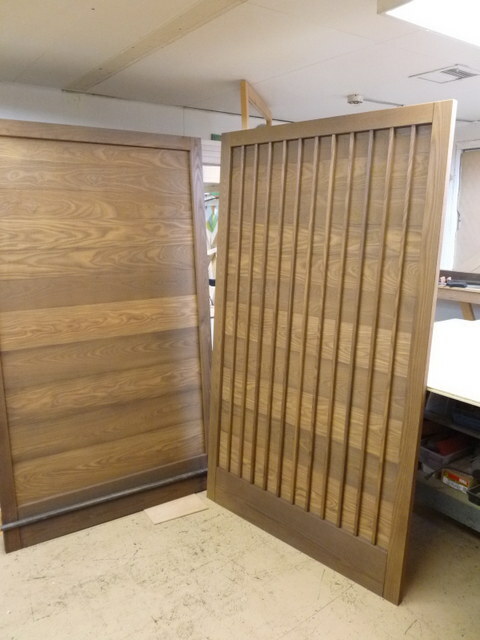 As the months went by, we kept in touch about it and it became obvious that their cabinet maker was too busy to even do it let alone collaborate about it. I was headed off to Peru at the time, and agreed to get together with them upon my return. By August, I had a design for a cabinet that I would build and incorporate some sliding Shoji for the face. They gave me the dimensions and wanted it to look similar to the existing Shoji. 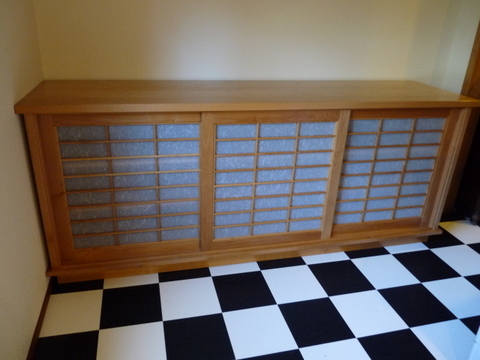 I wanted it be like a Tansu but had to really back off of all the detail a Tansu would have. It would greatly increase the cost and amount of time involved. In the end, I had to keep refining the design to make it come apart so it could be moved and I had to lighten it up or we would not be able to carry it in the house. Originally, I wanted this heavy top and bottom. I replaced that idea with a 3/4″ plywood bottom and added a 1-1/2″ piece all around the bottom plywood to make it look thick. 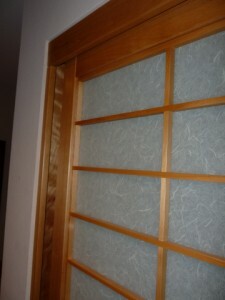 The sides are made similar to the Shoji Koshi-ita panels I had used in their Shoji. 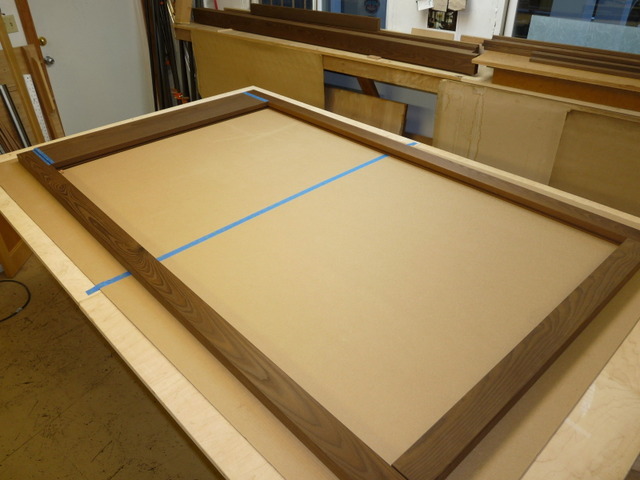 The size of the kumiko grid is very similar to the existing Shoji…3″ tall by 10″ wide with 3 rows across. A formula with a very traditional look that I use often. Lucky I designed this so it would come apart easily as there was a corner in the hallway of the house that made carrying this difficult. Turned out the room where it was installed was such that the ends are never seen. So including the kumiko grid on the ends was a moot point. 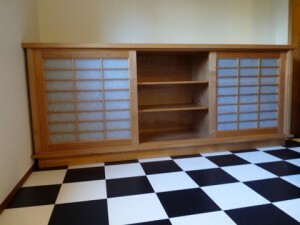 The clients love their cabinet and were so very nice to me. Lauretta even gave me a nice tip! my kind of client! My client has hired me a few times in the last few yrs. Lately, I cut down his closet doors in a basement room and added my typical hardware setup to good results. 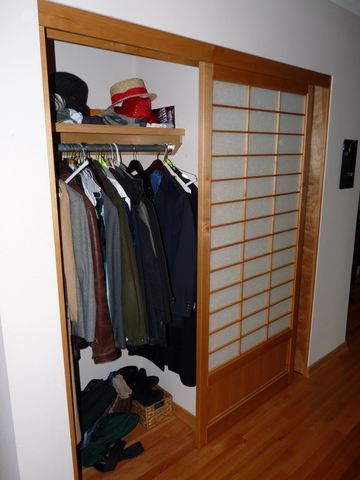 In todays bit, I installed shoji in a hall/entry closet. The client wanted a “mill-core” type trim detail. This means NO trim and the dry-waller (or sheet-rocker) tapes the jamb directly to the drywall. 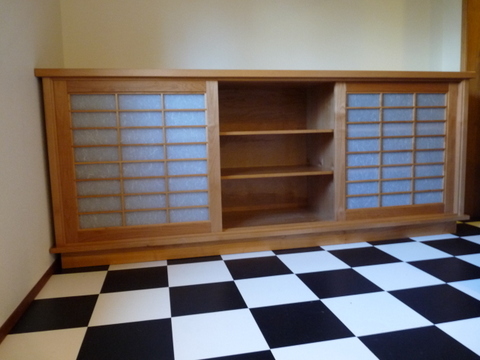 This was popular with architects wanting a super clean line…NO CASING. Why I’m doing my blog on this job is to point out the custom made jambs on either side of the doors. 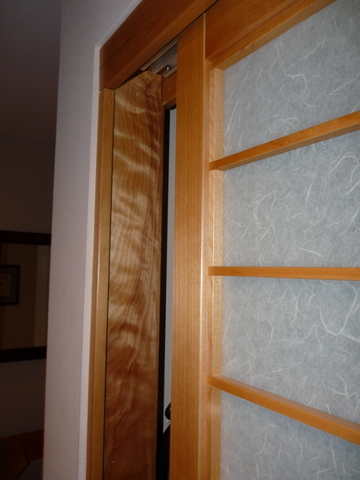 A “Jamb” is the finish wood that covers the wall stud and drywall edges. A typical interior wall is 4-9/16″ thick. This incorporates a 3-1/2″ stud and a layer of drywall on either side of this stud. Using 4-9/16 or even 4-5/8″ wide material will cover the stud and drywall nicely. Any smaller and you have problems with gaps. In this case, we have NO casing. Here is how I made these…I ripped 3/4″ Birch plywood or Alder plywood to 4-9/16″ wide. I used my nice finish blade with 80 teeth for a smooth cut. I milled up 3/4″ x 1-1/2″ solid wood (to match) and glued and nailed these pieces to the edge I will use as the front or leading edge. On the back edge I used 1/4″ x 3/4″ and glued and nailed all pieces to be flush with the edge that goes against the drywall and stud. All sanded flush with 220 grt. The top part of this piece is notched to fit to the header and the valance box pieces (these are usually 3/4″ x 3-1/8″). 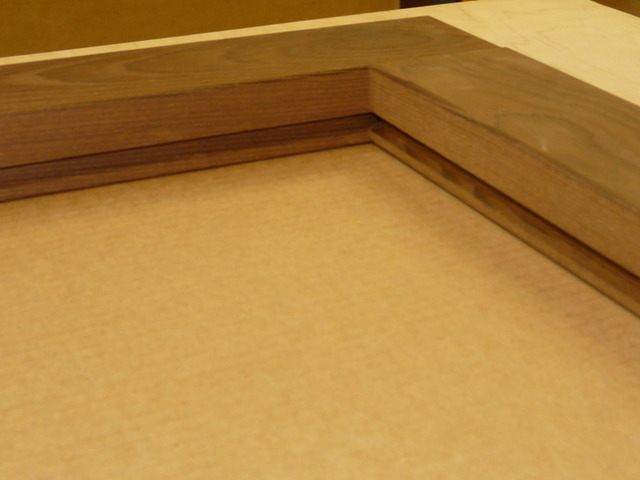 The 1-1/2″ pieces have the edges rounded over with a 1/8″ round-over bit in the router. If the closet has a light in it, use a valance piece on the front and the back of the track-box as the light will escape over the doors top and look bad. The bottom track will be trimmed to fit between the jambs. This can be used with casing. 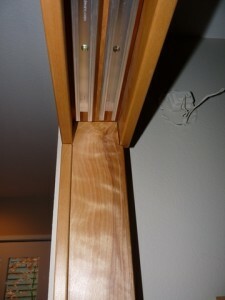 The main reason we did this was if the jamb is NOT installed plumb and very straight against the wall stud. 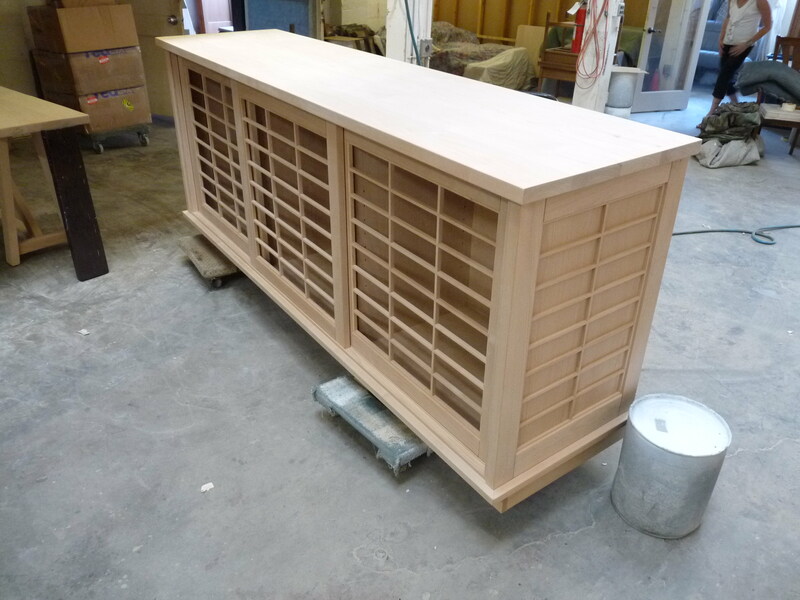 The shoji will not fit nicely and have gaps. The light inside the closet will show in the gaps…looking like it was installed by an amateur. The piece on the edge blocks that light some and looks much more elegant and finished. I recently got a call from a retro-60’s furniture store owner. He told me he had a client that need my services. 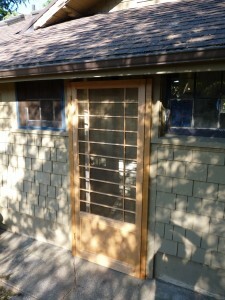 It turned out that the client; Tim, needed about 8 lineal feet of sliding door. Although he was of Japanese decent, he was not interested in Shoji. 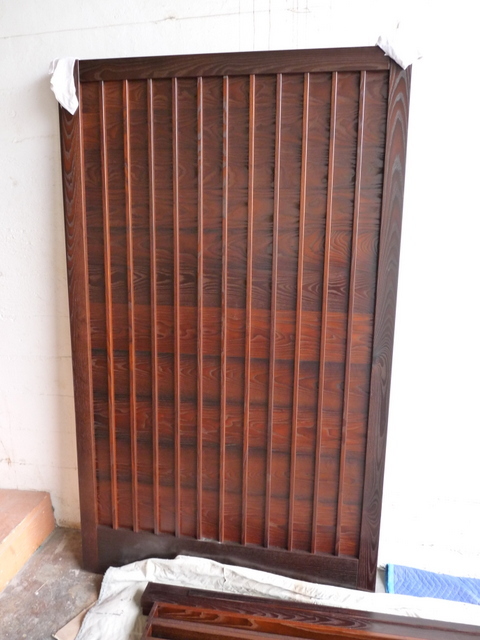 At my shop, I showed him a set of Amado doors I have from Japan and are about 80 or 90 yrs old. They are antiques that I keep around to show people. They are made of Pine and look almost exactly like what I built in the pics below. 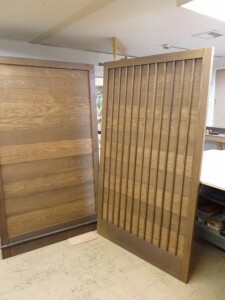 Tim loved them and we agreed that I would build him a pair of doors that slide on one track and slide to one side. They would be custom made to his opening of 94″ wide by 80″ tall. Wood: I chose a Tempered Ash. This wood might be called engineered. The manufacturer heats up Eastern Ash, normally a light yellow to blonde color with distinct grain. The wood is kiln dried then heated up so that the core is 180 degrees. This changes the composition of the wood. It cooks it! The wood turns a sort of dark caramel color throughout. This wood was designed to be used outdoors. Bug and rot resistant. And all without the use of chemicals. Great stuff. The frame is 1-1/2 x 3″ 3/8″ x 1/2″deep dado I jointed the edges of the 1/2″ panels so it would fit snug. These are re-sawn 2 x 10″. 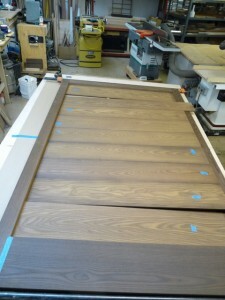 Rough-sawn to 3/4″, they are 1/2″thick once they are planed and sanded. 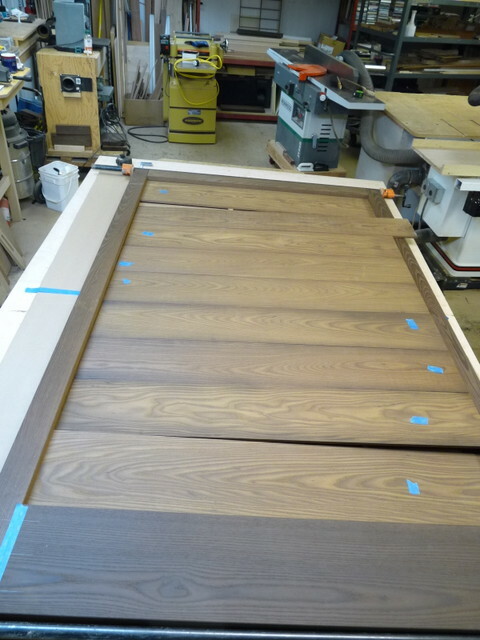 I applied 11/16 x 11/16″ verticle strips. 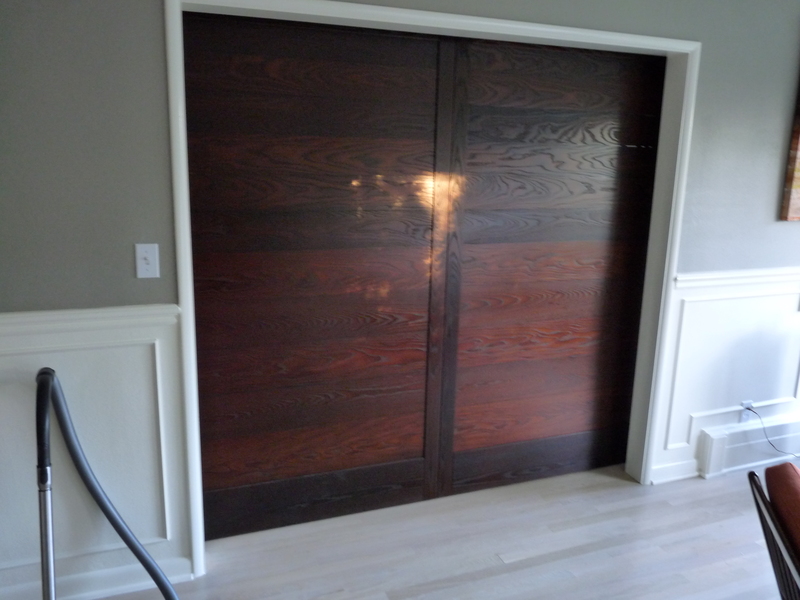 The doors were finished with satin sheen lacquer. Gives it an oiled look. This shot of the door at my shop lets you see the grain and color. Back side… This is the client’s private room that I screened away from the rest of the house. The original use of this type of door was a shutter that fit into a track. They were stored in a slot in the wall. Like a closet for the doors. 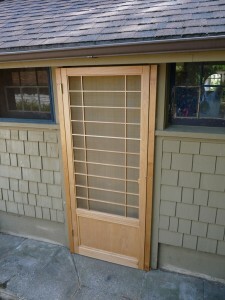 When a storm approached the house, the Amado were brought out and put in place, over the shoji. This protected the fragile paper.